Butter Bridge 1, which makes up part of the Twin Bridges area, is a level in the Butter Bridge in Super Mario World. It can be accessed through completing Vanilla Fortress. By completing this level, the player gains access to Butter Bridge 2. The player has 300 seconds on the Timer and the level autoscrolls. This level is mostly composed of Semi-Solid Platforms. Mario begins the level on a large platform with a small bridge on the side of it. Then, he comes to some Piston Lifts, which sink when he stands on them causing the other side to rise up. After a few of these, plus a Koopa Paratroopa, he comes to some falling platforms, as well as a Dragon Coin. At the end of this, Mario has to get to a bridge floating in midair by jumping on a Paratroopa. If he times this jump correctly, he can get a Dragon Coin as well. Then, after two more of the Piston Lifts, as well as yet another Dragon Coin, he finds some red ! Blocks to use as a platform (if he has found the Red Switch Palace) and a long line of Paratroopas, followed by another bridge and more Piston Lifts, this time placed in ascending and more hard-to-reach places. Here, the camera slightly moves faster as Mario returns to lower ground. Here, there is a Dragon Coin. After a few more platforms, plus a medium sized, non-moving one, Mario comes to another bridge, with Rotating Blocks, plus a Super Mushroom or a Cape Feather in a ? Block. Then, Mario must jump on top of the Rotating Blocks. At the top, there is a platform. 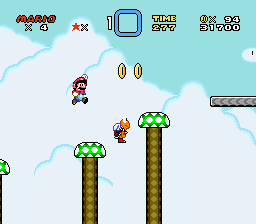 As he jumps onto this, the scrolling camera speeds up by a lot, and Mario jumps onto a falling platform, where he finds another bridge, as well as the last Dragon Coin. The camera slows down a little as Paratroopas fly at him quickly. Finally, the camera returns to normal speed as Mario reaches a big platform with a blue Warp Pipe and a Bonus Block. When Mario comes out of the Pipe, he is on a bridge and jumps through the Giant Gate, completing the level. This page was last edited on April 23, 2019, at 16:27.